Visit The Car Plays press room. 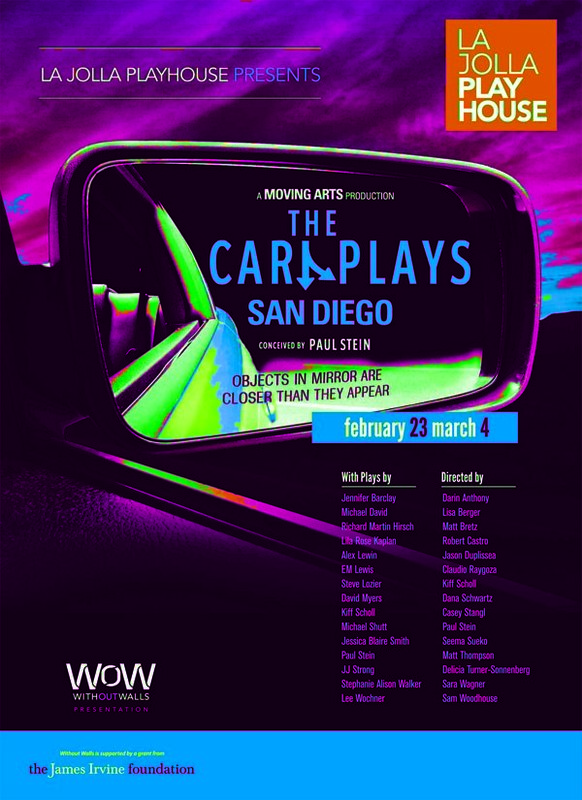 View The Car Plays gallery. On their freeway-congested drive to Disneyland, Dad (Trey Nichols) pulls the car over to scold his two misbehaving kids. No Matterhorn ride and the long trip home might be the resulting possibility. After a family spat, a sullen teenager (Matthew Bohrer) decides to spend the night in his car. But his father (Eddie Yaroch) won’t let him simply stomp away anymore. What is supposed to be a compelling night of site-specific theater, comically devolves, as the play never starts and the audience is forced to fend for themselves. With: David Youse and Ron Morehouse. A couple (Michael Shutt & D.J. Harner) finds the prospect of a short drive home unexpectedly daunting after circumstances lead them to make a painful decision. Two men (Jon Amirkhan and Ronnie Clark) for hire attempt to score a package, waiting for them in an unknown vehicle. The pickup and expectant delivery does not go as planned. On the fateful day of the Comic Con costume contest, two friends (Peter James Smith and Tony DeCarlo) confront the future of their dynamic duo. A drunken teenager (Zachary Martens) tries to dodge the cab fare. But this cabbie (Albert Park) is onto him. And he’s not taking it anymore. Leonard’s only son has signed up for the military. He leaves for boot camp this morning. With Will Tulin and Michael Zlotnik. A secret is revealed when two old friends (Wendy Elizabeth Abraham and Rebecca Davis) visit the seals off the coast of California. Pat (Derrick LeMont) visits the old neighborhood and runs into Karl (Andrew Miller), who resents his successes. Proof that, for Pat, you really can never go home again. A lonely, middle-aged woman of privilege finds unexpected compassion on the streets of San Diego. With: Lisa Goodman and Michael Mullen. A bereft mother (Sara Wagner) searches for clues to her son’s death as she cleans out his car and struggles to cope with her loss. Vic (John Polak) surprises Marla (Rhianna Basore) with a car for her birthday, but all she really wants is a divorce. Mr. Blackwell (Charles Maze) has been doing lots of naughty, naughty downsizing around the office. The members of the carpool (Samantha Ginn and Reed Willard) are out to set him straight. A maid-of-honor and a best man (Laura Buckles and Donald Rizzo) indulge in a post-reception tryst that leaves them both hopelessly caught between their pasts and futures.